Attached is a quick sketch of the item. It would be possible to have a fake bow-tie with retractable reels inside the wings of the bow. If you build it, they will bun. Nice sketch. 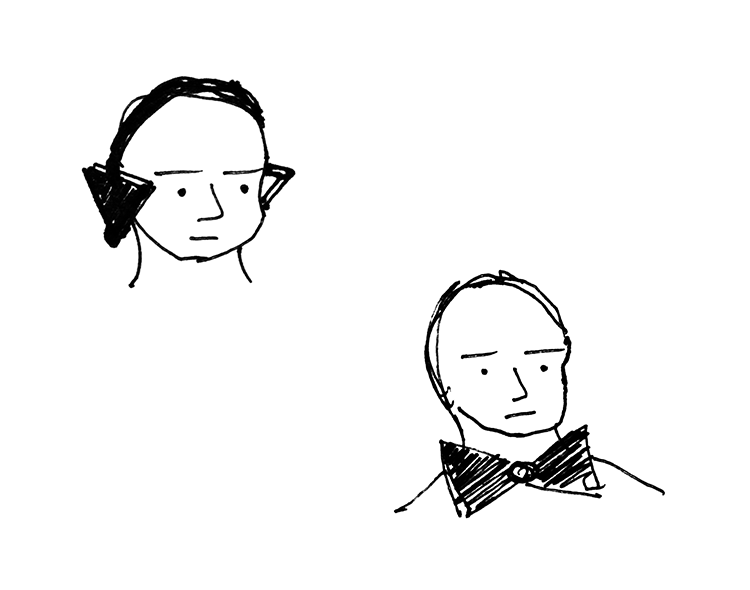 The bow-tie face is the serious, with the worried, do you like it? head recline, and the music listening face has that smirk of relaxation with a hint of the new music experience. And the idea is not bad too.
" If you build it, they will bun. " And if you did, and I wore them, which I would, I could use it as a recruiting tool to attempt to lure new contributors to the Halfbakery. This is the second in a series of ongoing posts aimed at repurposing existing ideas as recruiting tools. No ideas were harmed in the making of this annotation. Magnets at the triangular tips would link the bow nicely and be easily removed. Like those spectacles.